Altogether TriPeaks Solitaire Challenge is qualitative card game that’s certainly a must for anyone who enjoys a challenging game of solitaire. If you’ve followed latest launch of Solitaire games over the past few weeks, then you should know that one of favourite title would be TriPeaks Solitaire Challenge. Ever since the early days of computers, solitaire has been popular game. This classic card game is amazing way to kill time while having fun and TriPeaks Solitaire Challenge Game Review would help you to play better. I’ve been a fan of TriPeaks Solitaire Challenge for a while now, since they’ve released some number of exciting game features. While I like to relax, I prefer to keep finding new games and introduce for users, and I find this one as perfect exciting, particularly when there’s absolute excitement for users. TriPeaks Solitaire Challenge is a notable game that takes solitaire to a fun and challenging new level. It is widely appreciated that from boosts and power ups to competitive tournaments, this is one card game you don’t want to miss. TriPeaks Solitaire Challenge is professionally developed by XI-ART Sp.z o.o., is pretty simple to set up. You can also experience a handy tutorial that takes you through the basics of the game. Even if you have never played a version of solitaire before, TriPeaks Solitaire Challenge is accessible and simple to understand. Among many things people like the most about TriPeaks Solitaire Challenge is graphics. The animations and sound effects do a sensational job of immersing you in the game. At the end of each round player could see a round score, time bonus, longest run bonus, deck bonus, joker bonus, and total score. There are also numerous factors that add up to your total score, so you could try to adjust your gameplay accordingly if you’re trying to climb the leaderboards. TriPeaks Solitaire Challenge certainly lives up to its name as a game of challenges. The players could select to compete in a world challenge, Facebook tournament, or classic tournament. Each tournament has a respective leaderboard for you to climb and conquer, and players could play in more than one tournament at a time. Moreover there are added extra features such as levels and coins to earn. The players could even see your win history and earn achievements as you compete in TriPeaks Solitaire Challenge. All of these amazing features make for a fun experience. Anyone who adores special game will surely enjoy what they experience in TriPeaks Solitaire Challenge that’s for sure. TriPeaks Solitaire Challenge is available to download from Google Play. App Store and Amazon store for free. Generally there are optional in-app purchases for extras like power ups and also found that the game is balanced enough to not require them. 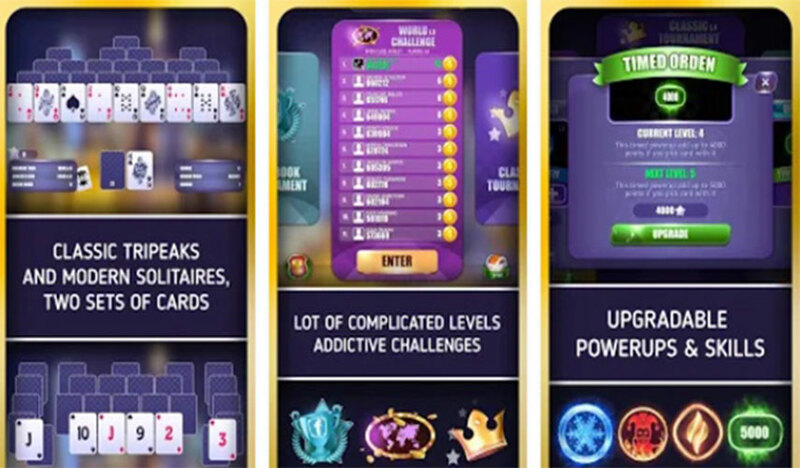 Altogether TriPeaks Solitaire Challenge is qualitative card game that’s certainly a must for anyone who enjoys a challenging game of solitaire. Needless to say, a lot of thought has been put into what the quality features and game plan would look like in this. They also have plenty effective features to keep players coming back for more and availability of tournaments are nice way to prove your skill. So we highly recommend giving TriPeaks Solitaire Challenge a try!